Elected officials from the 10 Miami-area cities told reporters at a news conference in Weston that the law prohibits changes their constituents have asked for since the school shooting. A Florida law prohibiting local governments from enacting their own gun regulations is invalid and unconstitutional, according to elected officials from 10 cities suing the state’s governor in the aftermath of a mass shooting that left 17 people dead at a suburban high school. The Feb. 14 massacre at Marjory Stoneman Douglas High School in Parkland has renewed criticism of the 2011 law backed by the National Rifle Association and signed by Gov. Rick Scott. A state law to pre-empt local gun regulations was passed in 1987, but the changes made in 2011 threatened local officials with removal from office and fines of up to $5,000. Elected officials from the 10 Miami-area cities told reporters at a news conference Monday in Weston that the law prohibits changes their constituents have asked for since the school shooting. “We get phone calls every day: What are you going to do about it? It happened in Parkland. It could happen in Miramar,” said Miramar Mayor Wayne Messam. Messam wants a new 5,000-seat amphitheater to be a gun-free venue. In Miami Beach, Mayor Dan Gelber wants to keep guns out of City Hall. Pompano Beach’s mayor wants to regulate gun shows at public facilities. Coral Gables Mayor Raul Valdes-Fauli wants to block the sale of military-style rifles within his city’s limits. The lawsuit argues that the 2011 sanctions overstep restrictions on a governor’s limited ability to remove a local elected official from office. It also says the law violates state rules protecting a municipal government’s authority to enact laws without fear of legal penalties against local lawmakers. The lawsuit also calls the law an unconstitutional restriction of local democracy — including the responsibility of a city’s elected officials to respond to constituents petitioning for local action after the Parkland massacre. It cites the threat of removal against Valdes-Fauli and other members of the Coral Gables City Council. Valdes-Fauli won unanimous council support in a preliminary vote for a citywide ban on the sale of military-style rifles, but the measure was narrowly voted down March 20 after the city attorney warned of severe financial consequences under the 2011 state law. Valdes-Fauli still voted for the ban, saying he thought the ordinance would help his city’s legal case against the 2011 law. “I believe in civil disobedience when the laws are unjust,” he said. Scott and Florida Attorney General Pam Bondi are listed among the defendants in the lawsuit filed in Leon County Circuit Court. 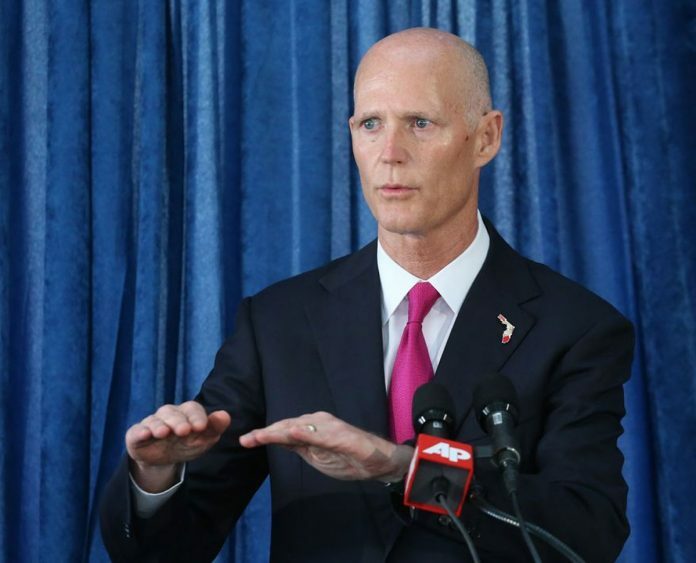 A Scott spokesman said the governor’s office was reviewing the lawsuit. A Bondi spokesman said they had not yet received it. Broward County commissioners are expected next week to ask their attorney to sue the state and challenge the laws. The county wants to regulate accessories to firearms such as large capacity magazines and create zoning ordinances that could outlaw guns at all times in some areas such as polling places and school administration buildings.